Microscope specimens must be prepared before they can be viewed under the microscope. There are several methods for preparation depending on the sample. Animal & Plant Tissues - these samples are sectioned by cutting them with a razor blade or the use of a microtome so they can be placed flat between a slide and cover slip and viewed under a biological microscope. Advanced microtomes can provide samples as thin as 1 micrometer. Hand-cut samples are typically thicker. The thicker the sample, the less light that can pass through it. Before cutting your sample, it is best to support it in some manner so that during the cutting process it does not become distorted. Internal and external support is best. In order to support the tissues paraffin or celloidin can be used. Paraffin is quickest and most common. Because paraffin is soluble in water, alcohol dehydration of the object is a prerequisite to embedding by this method. Freezing before sectioning the embedded material can also be successful. Wood - very thin slices or sections of wood are commonly required for microscopy examination. When fresh, most wood can easily be cut with a blade. If the wood is not fresh, soaking it in hot water or in an alcohol-glycerine mixture (equal volumes) for several days is a common procedure to allow cutting thin sections. Fibers - because fibers are often fairly flexible, they require some special support during sectioning. Drawing together bundles of fibers through a very small hole in a thin metal plate allows you to make transverse sections by drawing a cutting edge with the metal surface across the bundle. The hole will usually be about 0.5mm diameter and cutting is done on both sides of the plate with a razor. Fibers can be embedded in celloidon or gelatine, then frozen and cut in a conventional microtome. This method is most frequently performed in making longitudinal sections of fibers. Fibers are most commonly viewed under either a stereo microscope or if the fibers are extremely small, a metallurgical microscope is used. Bone - cutting any materials that contain lyme such as bones or animals with calcareous shells can be made possible by decalcification. The material is first fixed and then treated by special acid mixtures. A good decalcyfying agent is trichloracetic acid, which decalcifies rapidly and hardly changes the structure of the tissue. Bone is typically viewed under a biological laboratory microscope in very thin sections. Larger pieces of bone are viewed under a stereo zoom microscope. Rocks and minerals - creating thin sections of very hard materials is usually done by grinding. Small chips of rocks, minerals, or other such materials are cemented to microslides and the upper surface ground smooth on a flat metal or glass plate. When the upper surface is flat, the chip is removed by solvent action on the cement and remounted, flat side down. Then final grinding in a similar manner, but to a much finer degree, is continued until the material is of the proper thickness. 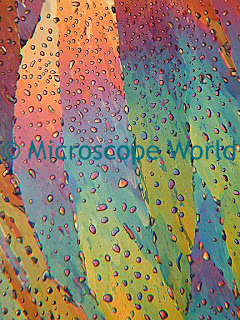 Rocks and minerals are typically viewed under a polarizing microscope. 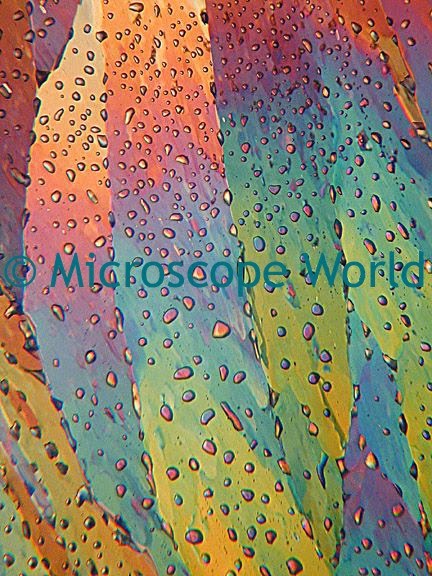 Minerals captured under a polarizing microscope. Microfossils - similar grinding procedures as those listed above are commonly used to expose chambers in microscopic shells or tests of microfossils. The grinding is continued until the section or specific attributes of the object are revealed. Source: Robert B. McLaughlin, Special Methods in Light Microscopy (Microscope Publications Ltd. 1977), 130.